Back in July, I made the near perfect discovery of a Polaroid 230. Brand new, in its box, with its original invoice dated from 1969 in djiboutian francs. If you do not know this line of bellowed cameras (Polaroid 100, 200, 300…), think of them as massive devices shooting instant pictures the size of small postcards. Here is the beast, below, compared to a Canon SLR. The challenge with this type of cameras consists in replacing a battery type that does not exist anymore in retail. The Eveready 531 or 532 was a quite large cylinder with snap connectors at both end. You can still find high priced substitutes, min. 10€, named A19PX. 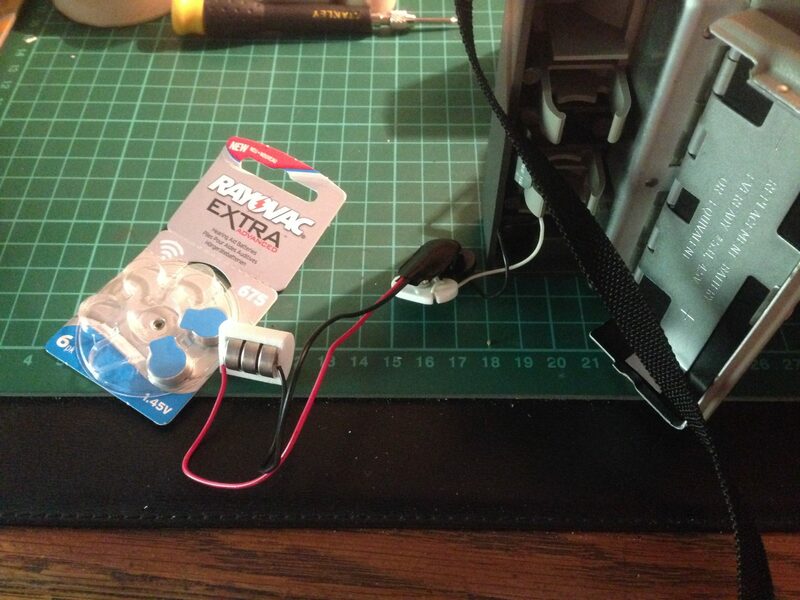 Numerous times, I encountered tutorials on the web that demonstrated how to replace the 3 or 4.5V battery with respectively 2 or 3 AAA batteries. The idea is appealing, batteries found everywhere. But these specific mods require you to irreversibly destroy parts of your camera using cutting pliers and other instruments of torture. Let’s tear it down to the bones! I’m now making a call: STOP! Do not butcher your cameras any more! Here is one solution, among others I’m sure, that will allow you to finally shoot packfilm for little money. Here starts the long list of the tools and items the substitution will require. You’ll have to find a substitute for a 3 or 4.5V battery. This requires 2 or 3 1.5V batteries. Among the smallest available, there are LR44 button cells. Alcalines have major drawbacks when it comes to photography, we’ll probably address the issue in future posts. What is required here is an important capacity, much more than what standard LR44 can deliver. That’s what draws people to use AAA batteries instead. The solution stands in zinc-air LR44 equivalents: PR44 coin cells. They can provide up to 6 times their sisters’ capacity. Voltage is a bit lower, 1.35V. It is not significant in our case. The price? Hold on tight. In most cases, less than 1€ per unit. Even less if you catch a bundle, I paid 26 cents per unit for a 60 pack. The smartest of you will have already looked up the original Eveready battery with Google and they will have noticed that the snap connectors look the same as those from a 9-Volt battery. They are the same. You’ll find these snap connectors for 25 cents max (e.g. at Selectronic). Pay attention to get a flexible connector, it will help with the camera’s large plastic connector holders. That’s the tough part, you’ll have to use your imagination. You can try to maintain the 2 or 3 batteries together using tape or strap band. It’s not optimum, it will probably fall apart at the wrong time. On the other hand it costs nothing. If you want a more secure setup, you’ll have to find a dedicated support. They are available on the web, sometimes with high shipping costs. You can also try DIY. I’ve not tried it myselif but I like the idea! Eventually, I used a 3D printed holder. Designs exist, by fellows on the web, and they can be ordered or downloaded if you’re the proud owner of a 3D printer. I’ve designed mine myself, and took advantage of another Sculpteo order to save on shipping costs. 6€, more expensive than scotch tape, but more secure. Tie your wires to the battery holder, place the batteries, snap the connectors in place. Et voilà ! If you’re clever enough, no need to solder, to cut or dismantle anything, let alone slash the interiors of a precious camera. Have fun with your Polaroid type 100 and send me the pictures of your setups and scans of your photographs!